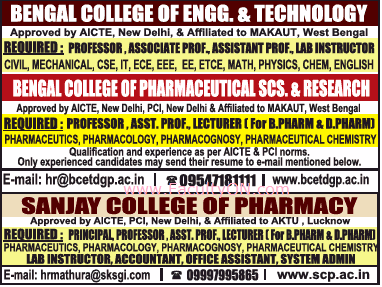 Bengal College of Engineering and Technology, Durgapur has advertised in THE TIMES OF INDIA newspaper for recruitment of Teaching Faculty- Professor / Associate Professor / Assistant Professor / Lecturer Plus Non-Faculty jobs vacancies. Interested and eligible job aspirants are requested to apply immediately from 27th July 2018. Check out further more details below. About College: Bengal College of Engineering and Technology, Durgapur was set up under the aegis of SKS Educational and Social Trust in 2001. The college offers a multitude of under graduate and post graduate degree courses in different branches of engineering and management. Proximity of regions premier educational and research institutes like National Institute of Technology, Durgapur; Central Mechanical Engineering Research Institute, Durgapur;, Indian Institute of Technology, Kharagpur; Indian Statistical Institute, Kolkata; Jadavpur University, Kolkata; Indian Institute of Engineering Science and Technology, Howrah; have resulted in vast pool of intellectual capital.